Today, we’re announcing the App Center, a new place for people to find social apps. The App Center gives developers an additional way to grow their apps and creates opportunities for more types of apps to be successful. 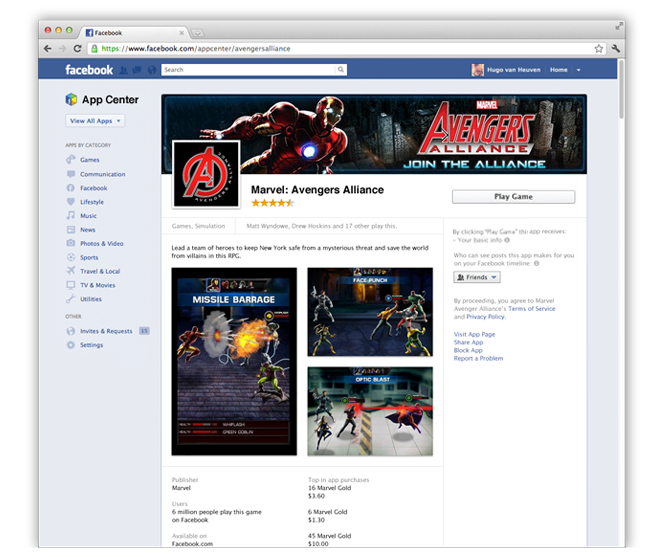 In the coming weeks, people will be able to access the App Center on the web and in the iOS and Android Facebook apps. All canvas, mobile and web apps that follow the guidelines can be listed. All developers should start preparing today to make sure their app is included for the launch. 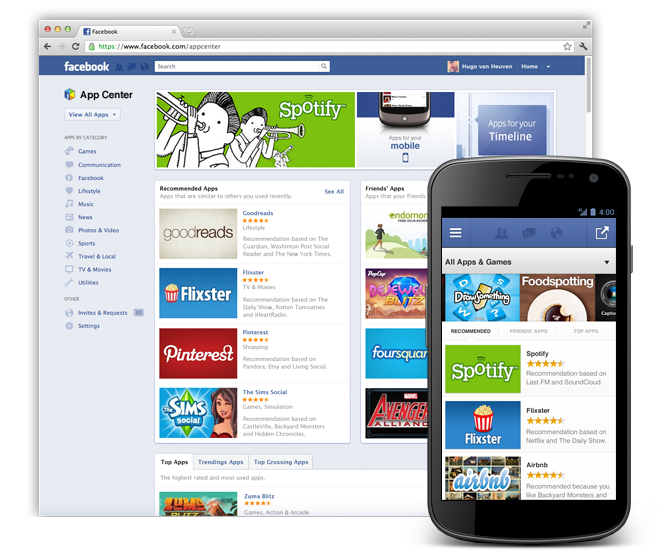 For the over 900 million people that use Facebook, the App Center will become the new, central place to find great apps like Draw Something, Pinterest, Spotify, Battle Pirates, Viddy, and Bubble Witch Saga. Everything has an app detail page, which helps people see what makes an app unique and lets them install it before going to an app. Success through the App Center is tied to the quality of an app. 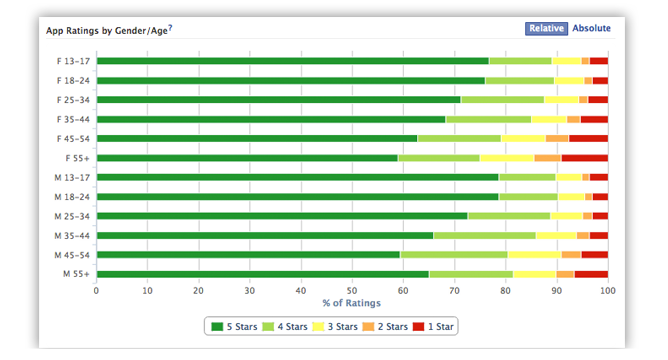 We use a variety of signals, such as user ratings and engagement, to determine if an app is listed in the App Center. To help you monitor user feedback, we are also introducing a new app ratings metric in Insights to report how users rate your app over time. Well-designed apps that people enjoy will be prominently displayed. Apps that receive poor user ratings or don’t meet the quality guidelines won't be listed. 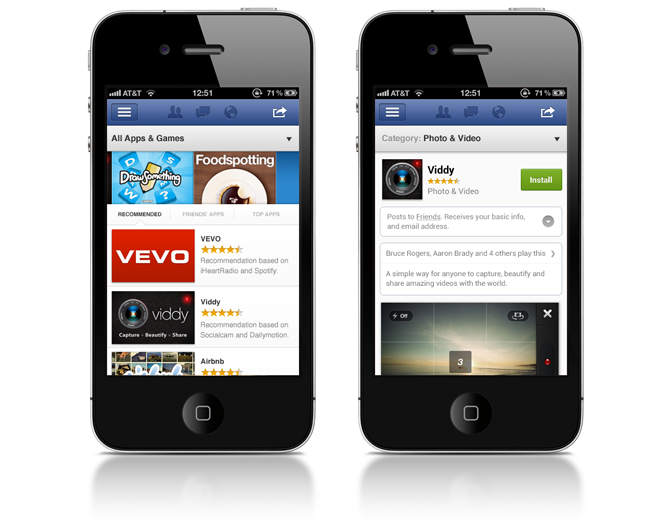 The App Center is designed to grow mobile apps that use Facebook – whether they’re on iOS, Android or the mobile web. From the mobile App Center, users can browse apps that are compatible with their device, and if a mobile app requires installation, they will be sent to download the app from the App Store or Google Play. To grow your mobile app through the App Center, your app needs to use Facebook Login. All developers should create an app detail page. The page is required for being listed in the App Center, and it will also become the new destination when non-users search for your app on Facebook. You can create an app detail page in the App Center section of the Developer App. There you can upload images, provide additional details, and configure the permissions your app requires. Learn more about setting up your app. Before creating your app detail page, read the guidelines to ensure your page does not get removed. App detail pages that are eligible for the App Center will be reviewed prior to being listed and priority will be given to those apps that submit by May 18. Many developers have been successful with in-app purchases, but to support more types of apps on Facebook.com, we will give developers the option to offer paid apps. This is a simple-to-implement payment feature that lets people pay a flat fee to use an app on Facebook.com. If you are interested in the beta program, please sign up to receive more information. We are excited to give developers a new way to grow their apps with the App Center. Get ready for the upcoming user launch by creating your app detail page today.